Let's Celebrate World Down Syndrome Day 2017! The 21st day of the 3rd month sees World Down Syndrome Day - the date 21/3 representing 3 copies of chromosome 21 which leads to the common condition. Each year I approach the day differently. I guess as Natty grows and we feel differently about our parenting as it evolves, so I view a national day in a different light. In the early days it was a chance of me to glean information and I was motivated to fundraise for local groups. Yep, there was even the year I took my clothes off to raise money Calendar Girls style... the less said about that the better! I talked of 'spreading awareness'. The notion of celebrating came later as our confidence and acceptance grew. In fact we probably didn't feel like celebrating in the very early shaky days if the truth be told. That's Ok too. We wear our colourful, mismatched socks, as the charities' suggested symbol of chromosomes, inclusion and difference, for we are all colourful and unique. These days I talk less of 'awareness', everyone is already aware of Down's syndrome after all, they might simply need a little re-education about the condition. 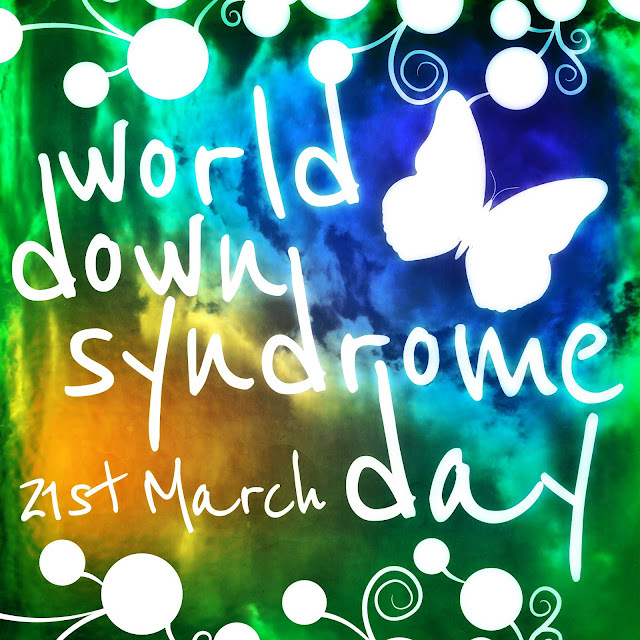 So today, we celebrate, educate, support and join together to spread the message of inclusion and the value those with Down's syndrome bring to our communities. It's a day to give the microphone to those champions and to listen to what they have to say and to this end the Down's Syndrome Association have launched a campaign called #MyVoiceMyCommunity. World Down Syndrome Congress have invited advocates to speak at the United Nations, we can't wait to watch them in action. I'll be busy sharing as many videos and books and links to charities and other useful resources as I can and I'd ask you to add your suggestions and posts to the linky below. You can also get behind the wonderful idea of Dad and graphic designer Mark Jones, WDSD logo doodler since 2012. Download his image and share a selfie on social media with the hashtag #WDSD17. Others are performing random acts of kindness all day, or taking part in school assemblies to talk about chromosomes.